“You’re her best friend.” It’s something my husband said to me once about our five year old daughter. Although I’m sure he doesn’t even remember saying it, it’s really stuck with me. I was complaining one night about Isabelle. It wasn’t complaints of her being naughty but rather of just never having a moment of silence with her. She loves to be with me. She wants to do what I’m doing. She wants to help. She wants to tell me every single thing that has happened since the last moment I saw her. Hell, she wants to tell me every single thing that happened during moments I was there. She is a talker. She is a do-er. She is in an analyzer. She is me. She is me in a beautiful, miniature form. Now let me tell you, spending the whole day with myself can be exhausting. Never mind, having two of me to tend to. Sometimes I just want to hit the mute button on my brain and on her mouth. I want to sneak away to Target by myself on a weekend and leave her home. I want to have a trip without incident, without endlessly talking about if we got everything on the list, what we are doing next, or what the boys are doing at home. I just want alone time. I often (somewhat begrudgingly) take her with me because I know she loves trips to the store as much as I do. Without fail, she will look at me at one point and say how she is enjoying our special “girls only” trip. For all the times I think of how I just want to be alone, I try to remember that she just wants to spend some one on one time with me. After all, I am her best friend. Each night when she goes to bed she draws in a journal. Every few weeks or so she’ll bring it down in the morning to show me her hard work. Without fail, every few pages amongst the pictures of butterflies there is a picture of me and her with a heart around us. 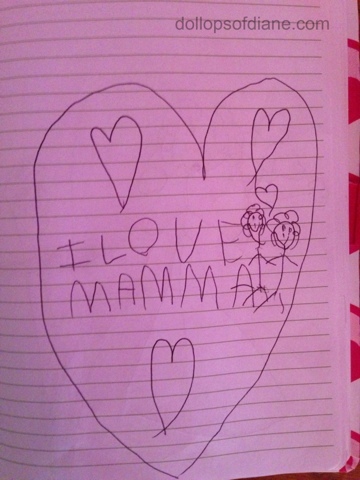 Without fail, there are pages covered with the words, “I love Mamma.” When she is upstairs in her bed, waiting for sleep, she is thinking about me and how much she loves me. This is what I remind myself of when I can’t get a minute to myself or a moment of silence. I am her best friend and someday in the not so distance future I will long for these days back again.